It is the goal of this blog post to provide you with a few thoughts that may liberate you from the urge to contemplate new equipment incessantly. I have observed that the more I photograph the less I think about equipment and vice versa. Of course, I find it a pleasure to use a well-built camera or lens. But a camera or lens is just a tool. What I really like about photography is the discovering and capturing of natural and man-made beauty in my environment. If I subscribe to all photo rumor sites (I am subscribed to a few), constantly think about what new camera or lens may allow me to take better photographs (to which I may succumb to more often than I should), it is unlikely that my photographs will improve and become more satisfying. What I try instead is to observe my environment consciously (a word I like a lot) and to see photographs irrespective of whether or not I carry a camera. I try to practice my art of seeing as much as I can! When I think little about taking photographs (which happened to me during the last weeks, for example), I start to think more often about equipment. Besides heading out and taking photographs (which I just did today) there are recurring thoughts that prevent me from buying in impuls. All these thoughts relate to the question whether or not I really need camera X or lens Y. In my opinion, three factors are important to decide whether something is a need: How often do I potentially use an item, what does an item provide (quality/new type of subjects) and how much an item costs. 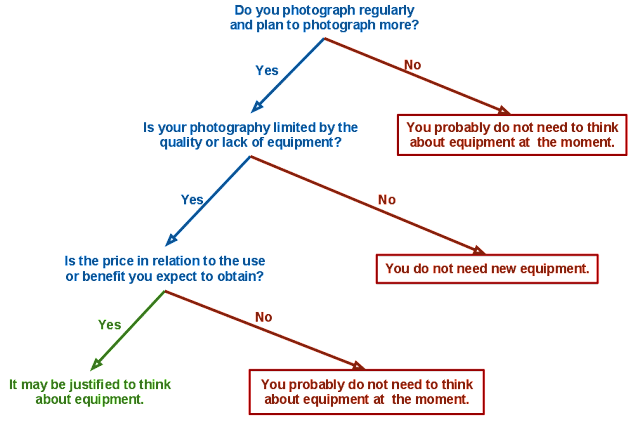 The decision tree depicted below represents what you may call a "camera buying prevention guide" that summarizes these three areas of thought. I think you should answer all three questions with "yes" before buying whatever piece of equipment. Let's imagine a possible scenario. I assume you own a reasonably advanced interchangeable lens digital camera with probably 10 or more mega pixels. The camera may already be a few years old, but it works perfectly fine and if you are honest, you are not using it often enough to warrant a replacement. In truth, you many not even exploit your camera's full potential. The last couple of months, maybe even years, you may have been working a lot and did not think much about taking photographs let alone actually taking photographs. Therefore, your "photography" has been limited to the reading of your list of photography blogs and websites. This is where you fell prey to the elaborate marketing machinery of the photography industry and to consumerism. The incredibly rapid product cycles, constant announcements and rumors all try to convince you that your camera is way outdated and that you absolutely need a new camera. But do you really need a new camera? 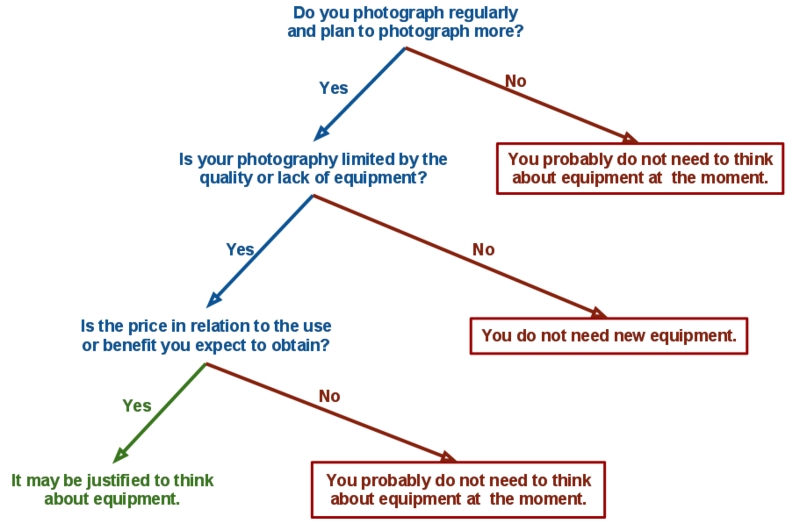 The decision tree above implicates that you should only start thinking about buying a new piece of photography equipment if 1) you photograph regularly and really use the tool you want to buy, 2) you are limited by not having the item you want to buy and 3) you think that the added functionality and use justifies the price of the item (and of course that you can afford it). I am quite sure that following this scheme conscientiously would drastically reduce photography item sales and would be very bad for the industry. But there is no danger, because consumerism is very powerful. However, I am sure that the few who manage to stick to these rules will actually feel relieved and liberated (and save a lot of money)! Based on my self-observation, I believe that the desire to buy photography equipment, also called compulsive camera buying syndrom (CCBS), is a substitute action for photography. CCBS is a manifestation of both, compulsive buying disorder (CBD) as well as obsessive-compulsive photography disorder (OCPD) and similar to the latter the best remedy for CCBS is to take photographs. Do you regularly photograph? Try to take your camera on photography walks at least once a week, start to photograph things in your house or flat, start a "photo a day" project. Call up your creativity by thinking about photographs and by taking photographs as often as possible.